KPI Metrics for Internet, IT, and ITSM Released Read on. . . Available with optional 12 or 24 months of update service. Order Now. . .
CIO and IT Management Products is the focus of the CIO Management Toolkit. 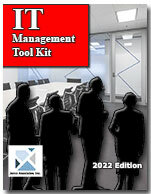 Best CIO and IT Management Toolkit is the CIO Management Toolkit. Janco's templates are all geared towards the processes CIOs and IT managers need. You have the option to purchase the everything from the CIO Management Toolkit to all of Janco's templates in the IT Management Suite. When you do, you save thousands of dollars and when implemented your enterprise is positioned to have a "WORLD CLASS" Information Technology function. You will be in compliance with all mandated requirements including all US and International requirements. The most popular individual job description. Used by HR professionals in both the public and private sectors.